As he weaves his thoughts between different subjects — from his relationship to his race (what does Asian American mean when you’re a Korean immigrant who just wanted to fit in?) and the characters he chooses to depict on screen (which almost always leads to a larger conversation on representation) to measures of success (“The career is just something that is not a part of me; it’s something that walks next to me, it’s not me”) — one thing becomes clear: At the end of the day, Cho just wants to make good movies that allow him to stretch his creative muscles. And so it is with “Searching,” his new film. Helmed by first-time feature director Aneesh Chaganty, the indie thriller explores the grief of David Kim, whose teenage daughter (Michelle La) goes missing following the death of his wife (Sara Sohn). The entirety of the film plays out through David’s eyes, which functions as a camera of sorts as we watch the story unfold on his computer screen. Chaganty, a self-described John Cho fanboy, and his writing partner Sev Ohanian wrote David with Cho in mind, but it required several entreaties before the actor came around. “[The film] was out of my comfort zone, so I said no at first,” Cho says. He’d seen “Unfriended,” really the only approximate example of a movie that takes place completely on a digital screen, and didn’t like the idea of acting for a static camera. And he definitely did not want to feel as though he were making a YouTube video. But at the same time, he did like the screenplay, if only interpreted as a more traditional picture, and was flattered most of all that the role — an explicitly Korean American one at that — was created for him. But it doesn’t stop people from asking him the same questions. The actor talks about being a focal point for Asian-American representation and why nobody wanted him to do his new movie Searching. 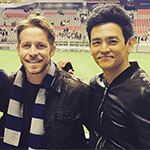 After reading dozens of interviews with John Cho, I realize not a single one of them doesn’t ask the 46-year-old actor about Asian-American representation—the lack of it, the future of it, how being a handsome Korean American with a lengthy IMDb page puts him at the center of that conversation. After all, he’s #StarringJohnCho, the guy that had his face Photoshopped by fans in place of white actors in the name of representation. But maybe he needs a break from that responsibility. Everyone does. 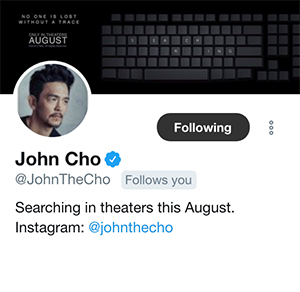 So, going into our interview, I think, Okay, I’m just going to talk to John Cho about his new movie. No Asian stuff this time.